Global Advantage is proud to announce the official launch of its new and improved online store! All maps listed above are available in print version. Maps from 2017 forward, are also available digitally, with clickable links to data resources, as a PDF format accessible for one year. Also digitally available is our hotly sought after, Budget 2019 Briefing Deck, created by David Watters and the GA team. Finally, as per the requests of our favourite clients, we have also created a few package options so that you can get exactly the GA products you need. For example, Canada’s Federal Budget 2019 Deck and Map Package features our newly updated and designed Innovation Ecosystem Map in digital and print version with the corresponding federal budget deck, with cost savings. 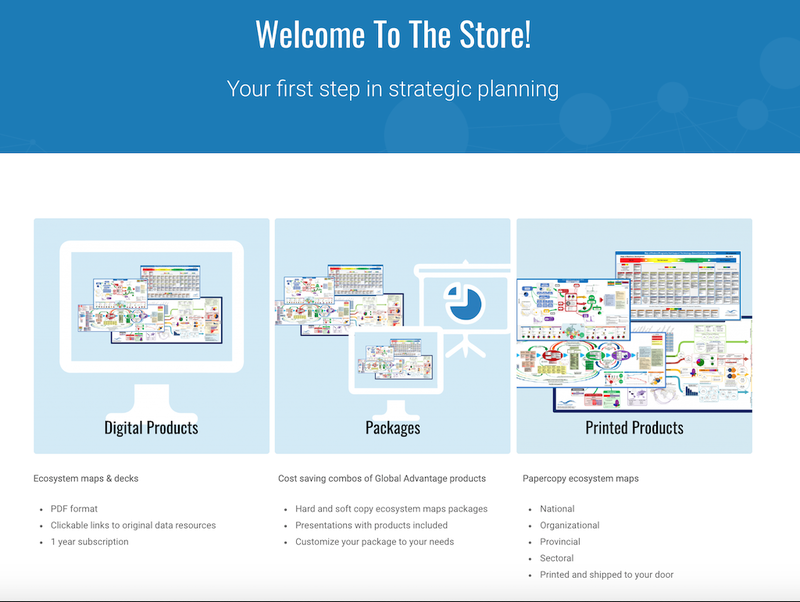 We invite you to explore our Global Advantage Store and order a map, deck or package for your first step in strategic planning.